Today is my birthday, so I’ll be taking a break from the blog today, and instead will be eating the peaches ‘n cream cake that I only get to see once a year! This is me on my first birthday. Back then, I had to have coconut cake because it was Grandma’s favorite, and the coconut reminded her of snow. So every year growing up, coconut cake it was. Talk to me: What’s your favorite kind of cake? Do you have a special cake that you only get to have on your birthday? Do you prefer homemade cakes or store-bought or restaurant cakes for your special day? Today marks the birthdate of a couple of my favorite authors. Mark Twain was born Samuel Langhorne Clemens on November 30, 1835. He was born around the time Halley’s Comet was visible on earth, and throughout his life, he predicted that since he arrived with the comet, he’d depart with it as well. He passed away on April 21, 1910, the day after the comet returned. He wrote numerous novels, short stories, and essays, though his most notable works included The Adventures of Tom Sawyer, The Adventures of Huckleberry Finn, A Connecticut Yankee in King Arthur’s Court, and Pudd’nhead Wilson. Huckleberry Finn was always my favorite with Tom Sawyer being a close second. However, I must admit that until I researched Mr. Twain for this post, I had no idea that he also wrote two sequels to his Tom Sawyer novel, Tom Sawyer Abroad and Tom Sawyer, Detective. Now I know what I need to add to my shopping list! One of Mr. Swift’s most notable books is one of my favorites: Gulliver’s Travels. The original title was Travels into Several Remote Nations of the World, In Four Parts, By Lemuel Gulliver, First a Surgeon, and then a Captain of several Ships. Now there’s a mouthful! As I’ve shared before, my grandparents raised me, so as far as I’m concerned, they were my real parents. Today my Granddaddy would’ve been ninety-five years old! He passed away when he was sixty-seven and I was seventeen. At the time, I thought he was old! Of course, now that I’m in between seventeen and sixty-seven myself, I don’t think that’s so old at all anymore! LOL! 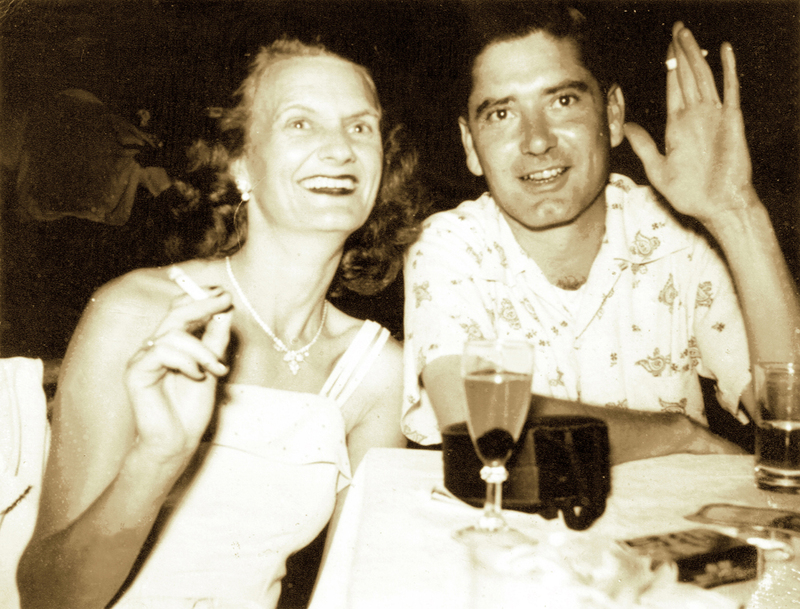 My favorite photo of Grandma and Granddaddy sometime around the late 1940s I guess. Before spending every evening in Granddaddy’s home school after spending the entire day in real school, I could go outside after school until whatever time the newspaper said sunset was. That meant I was inside the front door by that time, not in the yard and not on the porch. But it was my responsibility to check the paper daily. And if I was even one minute late, I was grounded for the rest of the week. Because all that education was shoved down my throat, I hated school with a vengeance. I didn’t like it anyway because my Asperger’s Syndrome made me anxious when I was around a lot of people, but knowing I’d have to go home and take all the chapter tests in every book just for Granddaddy even though the teachers never assigned them, and spending hours reading aloud instead of getting any downtime, made me resent every moment I was at school. As such, I did all I could to get out early. I took eleventh grade English in summer school and was therefore able to skip my junior year and graduate at sixteen years old. My other favorite photo of Grandma and Granddaddy on Guam in the 1950s. However, because of my disdain for school, I didn’t want to go to college after graduation. It was another five years before I realized how foolish that was and went. (And of course, it turned out that I loved it!) Furthermore, because of how strict my lifestyle was, I just wanted to feel loved, so I did what too many young girls do, and I fell for the first boy who came along and paid any attention to me. At only thirteen years old, I already decided I would marry that boy someday, a fact which Granddaddy absolutely hated. Granddaddy and me on his last birthday on earth. So Granddaddy and I argued over that boy, and we argued over school. All the time. It wasn’t until I was older that I realized that he only wanted me to have the advantages in life that his other children didn’t have because they dropped out of school. And while I still think he was excessively overzealous in his attempts to educate me, I do now fully appreciate his reasons for doing so. Happy Birthday, Granddaddy Pete! I love and miss you so much! I think it’s kind of funny that I write psychological thrillers, but I almost exclusively read Amish fiction. I used to read a lot of thrillers, horror, and other such stories, but a few years ago, I hit a patch of life that was so hard, I wasn’t sure I’d survive. That’s when I turned to the Amish and found their life to be peaceful and calming. So when I read an Amish novel, I enjoy finding out about their simple life, how they survive without electricity and gadgets and a lot of store bought items, how much faith they have that things will turn out the way they’re supposed to, and I also like when the author inserts some of the Amish’s High German. What I write is often based loosely on my own life experiences. And I haven’t had the easiest life. Nor have I had the most stable people in my life. So the psychological thriller genre works for me. However, when I write, it’s often emotionally draining because I have to vividly recall whatever incident I went through and relive it as I fictionalize it and put it to paper. As such, I then enjoy turning to a bit of Amish fiction to renew my optimism. Today marks the birthday of my second favorite Amish fiction author, Wanda Brunstetter. She’s written nearly seventy books with over eight million copies sold, many of which have been on top bestseller lists. So, if you have any interest whatsoever in Amish fiction, I highly recommend any of Mrs. Brunstetter’s novels. Happy Birthday, Mrs. Brunstetter! Today, Monday, October 27, 2014, my son Jeremy turns twenty-one years old. When I was pregnant with Jeremy, just as with my daughter, I had severe hyperemesis, and I was constantly in the hospital getting IV’s for my dehydration and shots for my nausea. Even water made me puke. I lost nearly twenty-five pounds during the course of this pregnancy. I worked as a cake decorator part-time and went to college full-time when I got pregnant, but because of all my nausea, I had to quit the job and rearrange my school schedule. By the time I was eight months pregnant, I was taking classes only two days a week both mornings and nights. My Tuesday and Thursday night class was Business Communications. When we started that class, the instructor told us that she’d take a letter grade off if we missed one class. Furthermore, she said she’d never given an A for that class in as long as she taught it, so we could already only count on a B. At the time, I was on the Dean’s List and was quite proud of my 4.0 average, so I was already upset that I might lose points just because this teacher was a hard nose. I had Algebra that Tuesday morning, and during class, I felt a few contractions. However, I’d experienced so many false alarms when I was pregnant with my daughter four years previously, I didn’t want to go to the hospital and be sent home, not to mention waste my day sitting in a hospital. By that evening’s class, my labor felt like it was quite intense. But it was still almost a month until my due date, so I wasn’t sure how to proceed. I told my friend who was in a different class that I might need her to drive me to the hospital. She chuckled and told me that childbirth was an acceptable exception to her rule. I got my friend out of her class, and we left for the hospital. They admitted me and told me I was in full-blown labor. My contractions were constant without any downtime in between. They asked me if I wanted an epidural, and I told them not to bother because it didn’t work when I had my daughter. They told me the epidurals were improved since then, and advised me to have one since my labor was so intense. After they put me on the waiting list for the epidural man to come around, I got bumped to the top because I dilated so quickly. But just like before, the epidural didn’t take, and I felt everything. Also just like before, I had no desire to push, and there was no way they were going to make me push that huge thing out of me for all the money in the world! Also just like before, the doctor had to break my water again, only this time I knew what to expect. I knew he’d be coming at me with an eleven foot long needle. So, when he came at me with a sandpaper hand glove instead, I freaked yet again! More than half a day since I was dilated and ready, I finally gathered enough courage to push, and Jeremy was born at 11:41 Wednesday morning. His umbilical cord was wrapped around his neck three times, and his lungs were underdeveloped, yet for being nearly a month early, he still weighed 6 pounds, 14 ounces and was 20¼ inches long! He was rushed to the neonatal intensive care unit, and I didn’t even get to hold him. As I predicted, the epidural didn’t take, and I felt the whole thing. And just like with my daughter, afterward, I stood and walked to the other bed because my legs were not numb. However, unlike the previous time, about an hour after I was settled back in my room, the telephone rang. I tried to reach it from bed, but it was on the far side of the table. So, when I stood to get the phone, I fell flat on the floor! Yes, about a half hour after my son entered the world, my epidural finally kicked in! I had fallen and I couldn’t get up! I was completely paralyzed and dead from the waist down. So I took the phone call then waited on the floor for another twenty minutes or so until a nurse found me and lifted me back into bed. I was so embarrassed! (But it was freakin’ hilarious, so feel free to laugh. Hard.) The nurse said she’d never heard of such a thing as the epidural being delayed like that. I told her I had the baby the day before and that I was afraid to miss her class because again, I didn’t want to lose a letter grade. She laughed and again said that childbirth was an exception to that rule and told me to go home. I never missed another class after that, and I was quite excited at the end of the term when she announced to the class that I was the first student to whom she had ever given an A. And Jeremy was released from the hospital, though he would end up being a very sickly baby and be back in the hospital numerous more times due to his underdeveloped lungs. I named Jeremy after the song “Jeremy” by Pearl Jam. So, in conclusion, I’d like to wish my son Jeremy a happy twenty-first birthday! Jeremy, I hope you’ll remember to be responsible and stay safe in whatever you do. And while you might feel like a man who knows everything now, just know that in a few years, you’ll look back on this day and laugh at how little you really knew. But that’s okay. It’s all part of the growing process. I love you, Smoodgie Bear, bigger than the moon. I hope you have a wonderful day and a blessed year! Happy Birthday, Sonny Bird! Today, October 21, 2014, my daughter Stefani turns twenty-five years old. When I was pregnant with her, I had severe hyperemesis, and I was constantly in the hospital getting IV’s for my dehydration and shots for my nausea. Even water made me puke. I lost close to thirty pounds during the course of my pregnancy, so I was very happy when she came out weighing a healthy seven pounds. I had three jobs at the time, one at a fro-yo store, one at a child care center, and one at Busch Gardens driving the monorail. I eventually had to give up all three jobs because I was so sick all the time. I also had Braxton-Hicks contractions from nearly the time she was conceived. Literally. Actually, all women have them through the course of their pregnancy, but I felt them. As such, by the time I was about eight months along, I had several occasions of going to the hospital with false labor. I lived with my grandma, and she didn’t drive. My birth mom lived about 20 miles across town, and it took about forty-five minutes to pick me up, then another forty-five to get to the hospital. So after a few times of my going in the hospital and not having a baby, she got aggravated and stopped coming when I called. Stefani’s dad was already involved with someone else at that point and didn’t want to be bothered with us. So, on October 21, 1989, I woke up with the worst stomachache ever (though it didn’t yet feel like contractions). Just the night before, I was walking in the dark and fell off a steep curb that was wet, and I was petrified that something was wrong because of that. I managed to drive myself to Stefani’s dad’s aunt’s house, and she drove me to the hospital. The hospital we went to was so small that Stefani was the only baby there! In fact, the nurses took her with them into the lounge and watched the World Series with her! I had an epidural, but it turned out that I was one of those rare cases that despite the procedure, the epidural never took. In fact, the hospital called the guy back out (from his spot at home where he was watching the World Series) to give me another one three different times, but none of them worked. Ideally, after an epidural, you shouldn’t be able to feel your lower extremities, walk, or even move your legs, and you should only feel pressure. That was never the case with me. Immediately after giving birth, I stood and walked to my other bed and never once felt numb. Not only did I feel everything, but I was apparently also a rare case who goes from being one centimeter dilated to ten centimeters dilated in less than an hour! Some people think this must be easier because the labor is shorter, but that’s not the case with me. Not only is it like one long contraction with no break in between, but I’m also the freakishly weird woman who never wants to push. Ever. Many women have to be told not to push, but that wasn’t the case with me. You could’ve given me a million dollars, and the last thing I’d have done would’ve been to push that baby out! So for having arrived at the hospital shortly after 11:00 that morning, being ready to deliver shortly after noon, my daughter was still not born until 6:35 that night because I just didn’t want to push. Furthermore, my water never broke, so the doctor had to do it manually. If you’ve never had this done, it’s done with an instrument that looks like a plastic, yellow crochet needle with a sharp hook, and it’s about seventeen feet long. (It’s actually only about twelve inches long, but when he whipped that thing out and came at me with it, it sure looked like it was seventeen feet long!) So because my water never broke naturally, I got to experience the agony of a dry birth. Lovely. Stefani was born with long, curly hair, and in fact, she had so much hair that after the World Series was over, the nurses played “beauty salon” with her and tied a bow in it. As a matter of fact, during the six hours that her head was crowned, the labor and delivery nurse called everyone she could find throughout the entire hospital (janitors, parking lot attendants, security guards, etc.) to come see how long her hair was. Seriously. Of course that’s just what every teenage girl wants… to be spread eagle with a bunch of strangers passing through to look at her privates and comment about what’s sticking out! I mean, anyone going through childbirth loses all sense of modesty by the time it’s over with, but come on! I should’ve charged admission! If nothing else, it did teach me a lesson about birth control. I named Stefani after the song “Stephanie” by none other than The Partridge Family, though on the show, it was performed by both Bobby Sherman and David Cassidy. So, in conclusion, today, October 21, 2014, my daughter, Stefani turns twenty-five years old. Yes, that’s right, Stefani, you have been on this earth for TWENTY-FIVE YEARS. That’s a QUARTER OF A CENTURY! You’re TOO OLD to try out for The Real World. You are TOO OLD to fit into the “18-24” demographic. So, my darling daughter, do not call me old again, because it’s better than the alternative. And besides, now you’re finally catching up to me. Some cool things about being your age? You’re finally old enough to be elected into the United States House of Representatives. You can now rent a car. And the best one? You’re now twenty-five years wise. Just think of all the things you thought you knew when you turned eighteen. I love you, Pookie, with all my heart! I hope you have an amazing day and a blessed year! Happy Birthday, Gooberina! Happy 95th Birthday, Grandma Toby! As most of you know, I usually only commemorate my favorite authors’ birthdays on my blog. But today is special. Today is my Grandma Toby’s 95th birthday. And even though she never wrote a book, she read me plenty of them. Also, she’s the same Grandma Toby that my novel What Would The Neighbors Think? is based upon. As I’ve frequently shared, my grandparents raised me from birth, so Grandma is really my mom. I’m sure it’s kind of a bittersweet day for her. Toby’s two favorite things were eating and talking. She’s also stubborn, silly, and prideful. But about three years ago, her dementia was getting bad, and she kept falling down. Because she’s so old, her skin was about as thick as that of an onion, and she kept bleeding all over the place and couldn’t get stitches. Then she got a stomach malady and had to be hospitalized. While she was in the hospital, they discovered that she had some sort of thing wrong where she was inhaling part of her food and beverage into her lungs when she ate, so they insisted on giving her a feeding tube. What they failed to tell me or my birth mom was that the breathing tube would be permanent. We were led to believe it would be out in a couple of weeks. So, to make a long story longer, she couldn’t live at home with my birth mom any longer once the tube was in. Only certain nursing homes are even equipped to take patients with feeding tubes, and they are not the better ones. So now, she can’t eat or drink, not even a Tic-tac and a sip of water. She’s had a series of mini-strokes after she went into the home, so she can’t talk anymore. Her face is now forever paralyzed in a silent scream. (So much for being stubborn and proud.) She can’t walk or use the restroom anymore. The advanced Alzheimer’s has set in, and now she can’t even remember her own name. Yes, her body is as healthy as a horse (at least a horse that’s in good health), and she’ll likely outlive everybody else at The Home. So, let this be a lesson to all of you: Be careful what you wish for. Happy Birthday, Grandma Toby! I love you, wherever you are! Toby Then… For you Car Experts… Can anyone tell me the approximate year of this car? I’m guessing mid-1940s?